In a conversation this afternoon, William F. Lee, senior fellow of the Harvard Corporation, reviewed the progress of the governing board’s most pressing current priority—conducting the search for the successor to President Drew Faust, who steps down next June 30—and touching on other University matters, from research in the life sciences to the operation of the Corporation itself. Lee has assumed the responsibility for this sort of occasional communication about the board’s work since he became senior fellow in 2014 (read accounts of similar, prior briefings here and here). The information-gathering stage. Touching on the highlights of an extensive Gazette interview on the search published earlier this week, Lee said the 15 members of the search committee have been “moving ourselves through the first stage of the process,” conducting broad outreach to the extended Harvard community through a broadcast email to 375,000 recipients (which elicited 1,500 responses); one-on-one meetings with 200 individuals; and meetings with a couple hundred more people in group settings. He singled out “very, very good faculty, student, and staff advisory committees,” and expressed gratitude both for the information they have provided, and for their chairs’ further efforts to extend the search committee’s reach. Collectively, through those efforts, “We’ve learned a lot about Harvard’s strengths and challenges,” he said. “I’ve learned a lot about the characteristics and traits” that a Harvard president should have. This process will continue through year-end, Lee indicated. Toward finding candidates. Now, the search is moving into what he characterized as its second phase: focusing on identifying the right candidate for the presidency. As of this morning, he said, 694 individuals had been suggested—some of them multiple times—and the search committee has begun to go through them in a disciplined way (looking, he joked, for a Marvel comics “superhero” who could fulfill every requirement associated with the position). To date, he said, the deliberate search process had accomplished what the committee members had hoped for; now, the harder work begins. First, “how different the context and landscape are from 11 years ago,” during the search that identified Faust. Higher education, he said, “is in a different place.” It has come under attack in some parts of the society, as has the validity of intellectual curiosity. Accordingly, a new president will have to be able “to articulate the case for higher education, articulate the case for research, articulate the case for fact-based intellectual inquiry.” That responsibility has always come with the Harvard presidency, he noted, but now more than ever. Second, “the desire and appetite from people associated with Harvard to make Drew’s ‘One University’ not just a slogan but implemented” is more robust than he imagined. There is strong sentiment, he said, for removing structural, cultural, and financial barriers to interdisciplinary work across the institution. Third, “the student body is very different from what it was 11 years ago.” In fact, he added, the student, faculty, and staff cohorts are all more diverse and eclectic, meaning that the University must address new needs and faces new challenges. Other themes sounded through the search—that Allston represents a major opportunity for Harvard’s future, that the University has to have the financial foundation to support its research and teaching—were already recognized, he said, and continue to be basic priorities. The leader’s traits. 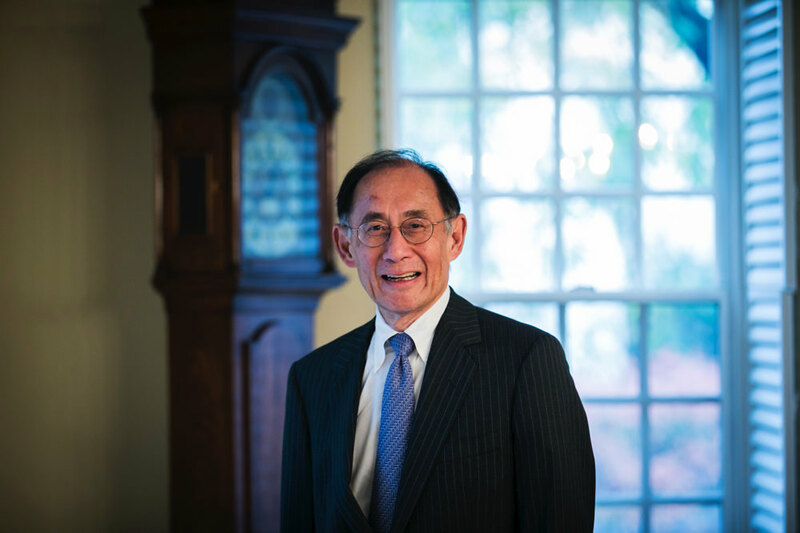 In the Gazette interview, Lee identified “the fundamental human characteristics—the integrity, the ability to be trusted, the ability to communicate, the emotional intelligence, the intellectual curiosity, the ability to grow—that will allow the person to address all the many responsibilities” of leading the University. In today’s conversation, he was asked whether experience in managing a complex, large organization, which Harvard assuredly is, also mattered. Life sciences. During a conversation last year, Lee made a strong case for Greater Boston’s potential preeminence as a national, or even world, center for emerging life sciences and biomedical research, anchored by Harvard, its affiliated hospitals, and associated universities and biomedical research institutions. Asked to describe steps toward realizing that potential, he pointed to three developments. First, he said, within Harvard, three central deans are now in place: Francis Doyle (engineering and applied sciences), Michelle Williams (public health), and, most recently, George Daley (medicine). The trio, he said, “recognize the unique opportunity that Harvard has to work across [their] units, with the Faculty of Arts and Sciences [FAS], and units like the Broad Institute” (the Cambridge-based genomics center established by Harvard and MIT). The combination makes for “a phenomenally robust life-sciences community,” he added. Daley, he said, was energetic and full of exciting ideas, and work was under way to come up with ways to finance them. He added a detail to what is known externally about the changes within the Corporation. Last year, Lee discussed the governing board’s five-year review of its reconstituted operations. But he also noted that while members of the Corporation are now limited to 12 years of service, they are also individually evaluated after six years, before a renewal term—a process that began with Lee himself (he was appointed in 2010), and then followed for Lawrence S. Bacow (Tufts president emeritus, who was appointed in 2011). Those kinds of disciplines, Lee said, ensured that in decades to come, the Corporation ought to remain recognizably the kind of governing board it was meant to be, while ensuring that it evolves sufficiently to adjust to Harvard’s needs. Harvard’s fisc. The Corporation’s fiduciary responsibilities extend not only to choosing and evaluating the University’s president, but also to assuring its financial soundness. Given the constraints associated with lagging investment returns and the restructuring of Harvard Management Company (HMC) in an effort to bolster the performance of the endowment, Lee was asked whether the Harvard Campaign, which has raised well over $8 billion, would be succeeded quickly by a new fund drive in a new president’s administration. Lee said that the steps being undertaken at HMC were necessary, given changes in the financial landscape since it was organized three decades ago, and that the changes were now proceeding with the right model and in the right hands. But he said the Corporation was “realistic about what the pressures are on the financial model” for higher education (a theme sounded in the annual financial report), and was “constantly planning to be ready to address” those challenges. The University and HMC were well positioned to address these issues, if anyone could, he said.